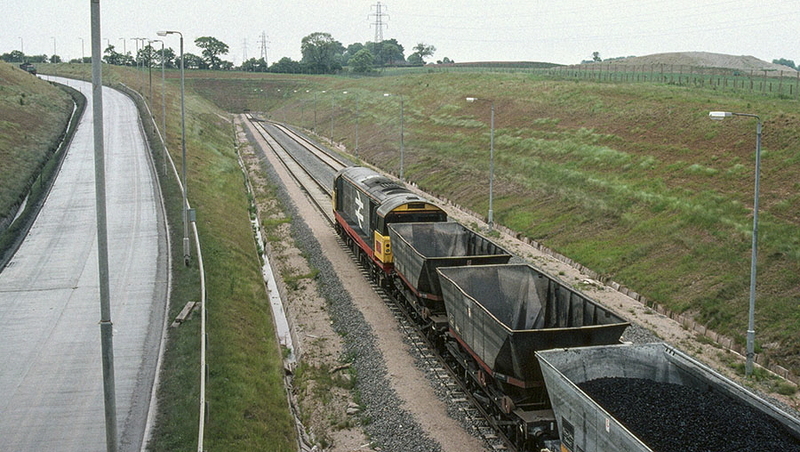 The Lounge coal preparation and disposal point was built to serve an opencast coal mine near Lount, Leicestershire. The disposal point was just to the south-east of Ashby-de-la-Zouch and was connected to the Leicester to Burton railway line. It had a short life, just while coal was being produced at the opencast site, from 1985 to 1993. 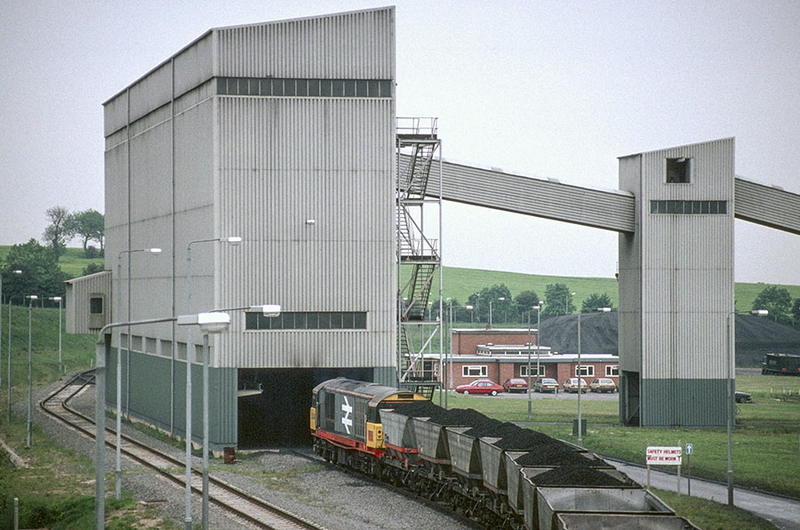 Subsequently, main structures were demolished, but the rail link to the Leicester to Burton line was retained, being used for reversing trains to the Hicks Lodge opencast site to the west of Ashby. 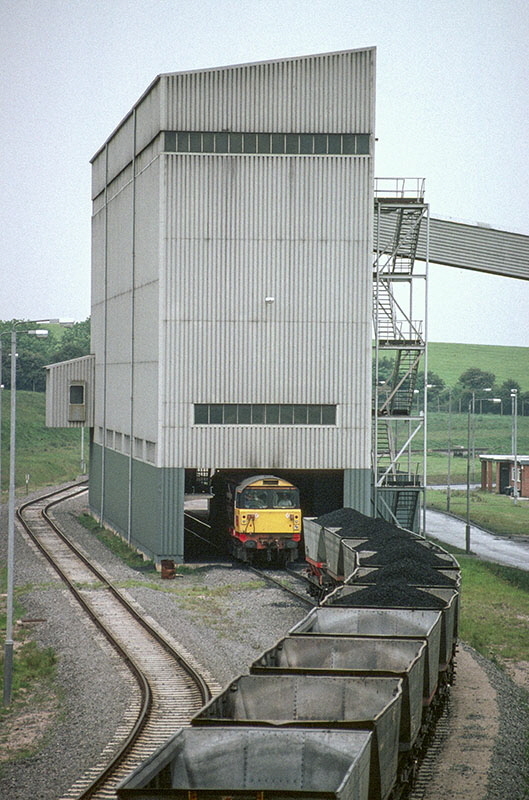 The use of the rail sidings ceased in 2004. I had sometimes used the road between Coalville and Ashby which passes by bridge over the sidings at the disposal point. Usually when I glanced down the disposal point was deserted, however one day in 1990 there was a train below. So I parked up and photographed the train as it completed loading, the loco ran round, and then the train departed, as shown below. As of 2019 the tracks are still in place on the derelict site. A planning application has been passed for a warehouse development here, retaining the rail link. However the planned route of HS2 impinges on this site so a revised planning application has been made but with the rail link removed. The photographs in these railway photograph galleries are available for use under a Creative Commons Attribution-ShareAlike 4.0 International license. Attribution should include a link to www.nigeltout.com. 1-of-5) Cl-58 Co-Co locomotive no. 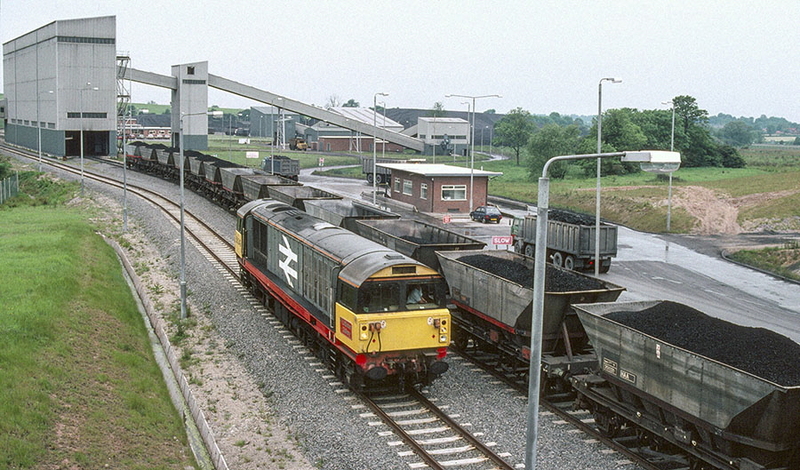 58049 on the front of a train being loaded with coal at Lounge coal disposal and preparation point, 1990. Click here for a high-resolution image. 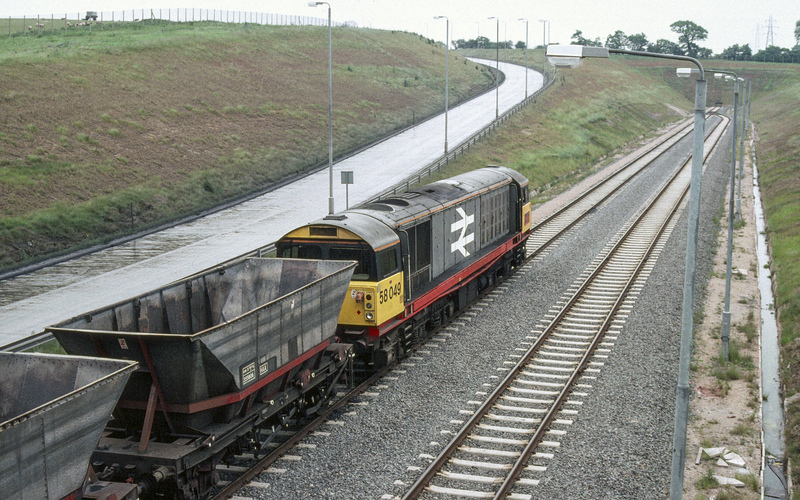 2-of-5) 58049 slowly pulls the wagons at very low speed as they are being loaded with coal under the rapid loader. 3-of-5) 58049 has pulled the train through the rapid loader in the background and now runs round the wagons in order to pull the train out onto the Leicester to Burton line. 4-of-5) 58049 moves under the rapid loader to couple up to the wagons which have just been loaded with coal at Lounge coal preparation and disposal point. 5-of-5) 58049 departs Lounge coal preparation and disposal point, hauling the loaded train through the rapid loader and then on to the Leicester to Burton line.